The FBI has reported a steady downward trend for crime in Connecticut since 2014, which could be attributed to better security measures and adequate employment of police and law enforcement professionals in major cities and towns. From serving as a detective to working at the court house, there are several rewarding careers to explore in legal and protective fields across Connecticut. 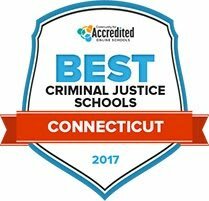 Those looking for what to study in criminal justice school can get career information here before receiving the training they need at Connecticut's reputable and accredited criminal justice schools. This guide provides information about the best schools, degree options and career resources available for criminal justice students. After Criminal Justice School in Connecticut: What's Next? Searching for criminal justice schools in Connecticut that offer affordable programs, an array of options, and the right degree levels for different legal and protective service career paths can be a challenge. Use the list below to narrow down the search-this details the best programs in the state based on important factors like tuition costs and graduation rates. See who ranks highest below. Housatonic Community College's associate in science degree with an emphasis in criminal justice is designed to aid new students and students with previous work experience alike. Administered through both online and in-person courses, all Housatonic Community College classes will provide students with a path to the fulfilling career they hope to achieve. Many classes at HCC are also fully transferrable, giving students the opportunity to relocate or move into a four-year institution after finishing their HCC program. Because earning a college degree is often an intensive pursuit, HCC provides several student services to make sure their learners stay on track to finishing their program. Manchester Community College offers numerous criminal justice programs, including an associate of science degree and four specialized certificates. Students interested in pursuing a career in criminal justice will be provided with a thorough education administered through specialized classes taught by experienced faculty members. Students interested in finishing their degree sooner may wish to consider MCC's winter and summer courses. MCC allows its students to fill their free time with on campus events, mentoring programs, and student employment. The MCC campus also comes complete with a fully equipped fitness and recreation center, allowing students to regulate their wellness while furthering their education. A career in the criminal justice field awaits students graduating from Naugatuck Valley Community College with an associate of science degree in criminal justice and public safety. In addition to completing their traditional two-year program, students will be able to concurrently complete one or more of NVCC's specialized certificates. The staff at NVCC is conscious of the fact that earning a degree can cause financial stress; that's why a variety of financial aid packages and flexible payment plans are available to all qualifying students. If a student begins to feel that they are falling behind in their studies, they have the option to catch up with NVCC's tutoring center and advisement center. Graduates from Tunxis Community College's associate program for criminal justice will find they have received the education necessary to succeed in their future public service careers. Law enforcement classes are taught by faculty members who are familiar with the criminal justice field, and students will be in classes small enough to ensure a personalized experience. Online classes are also an option for students who are looking to spend less time on campus and more time working from a location of their choosing. TCC strives to honor as many transfer credits from outside institutions as possible, helping students to earn their degree in an efficient and timely manner. At Three Rivers Community College, students are able to pursue their associate degree in various criminal justice fields including enforcement, treatment and criminology studies as well as certificates in criminal justice and security loss prevention. The associate degree programs are designed to prepare students to enter entry-level positions or transfer to a four-year college upon graduation. The school works closely with over a dozen four-year institutions to ensure easy transfer of credits. The Advising and Counseling Center is available for students to learn more about their academic options. The University of New Haven offers both AS and BS degrees in criminal justice, a BA degree in forensic psychology, a variety of criminal justice certificates and related minors such as forensic science, fire science and arson/fire investigation. BS students will complete required core courses, and can choose electives with concentrations in corrections, crime analysis, investigative services, juvenile and family services, law enforcement administration and victim services administration, with internship opportunities in their areas of interest. The AS degree can be earned once a student has completed the first two years of either the law enforcement or corrections courses. Sacred Heart University (SHU) offers a minor, bachelor's or master's degree in criminal justice, along with a five-year accelerated BS-MA degree, which is designed for high school students demonstrating academic performance and an interest in the criminal justice field. BS students will complete an internship with either a public or private agency within the criminal justice system, and master's students will be required to take a comprehensive exam, or produce a thesis if planning to later pursue a PhD. Police, correction, parole and probation officers currently enrolled in the SHU criminal justice master's degree program may be eligible to receive reduced tuition. Goodwin College has several career-focused degree programs, including associate degrees in criminal justice and homeland security. Criminal justice students can complete general education courses online, while the degree specific courses are on-campus, with day and evening classes available. Students can choose electives concentrated in areas such as homeland security, computer crime, forensics and law enforcement, and are required to complete their degrees with either a research project or an internship, which are chosen and secured by the students themselves. Graduates go on to work in a variety of settings, including law enforcement agencies, corrections, security, customs and border patrol. The Justice and Law Administration Department at Western Connecticut State University (WCSU) offers a minor in justice law administration and a BS degree with concentrations in law enforcement, corrections, criminology, legal studies and paralegal preparation. The BS typically takes about four years to complete, preparing students to continue to graduate or law school, or for employment in the criminal justice field in areas such as law enforcement, private security, investigation, rehabilitation and paralegal. WCSU resources available to criminal justice students include academic advisement through advisors and faculty, the Ancell Mentor Program, career services for both students and alumni and the Justice and Law Club. At the University of Bridgeport, students can minor in pre-law or criminal justice, and can also pursue a BA degree in social science with a criminal justice concentration, or a BA or MA degree in criminal justice and human security. These degrees prepare students for careers in the criminal justice field while also providing a foundation for graduate school, depending on students' goals. For completion of the master's degree, students will complete a capstone course, a competency project, an internship and two years of foreign language study. Internships available to students are commonly with local and state city police and federal agencies. Whether students are interested in pursuing careers as a police officer, private investigator, paralegal or court clerk, it's important to find a school that offers the right level of training and educational opportunities for the job. Use the search below to compare schools, and switch between priorities, such as acceptance rate, tuition, majors and concentrations. It can be helpful to compare salary potential and career opportunities in Connecticut to national averages to see which type of careers are worth pursuing in the state. Students interested in criminal justice school in Connecticut can see how the state stacks up for compared with criminal justice careers nationally. Primarily responsible for the collection of taxes in the state of Connecticut, this organization is also a valuable resource for individuals who need to register a business and learn about business requirements. A comprehensive website outlining business development initiatives, small business resources, financing options and the last updates from the commissioner. Provides information about laws and legislation, minimum wage requirements in the State of Connecticut and employment and training services. A comprehensive section of the State of Connecticut website with a fugitive tip line,statistics, victim services and employment opportunities. Those interested in helping inmates after their release from the Department of Corrections can get more information on Connecticut's various parole and community service programs here. Providing recovery services for parolees, the Community Partners in Action group advocates for criminal justice reform. This site also includes employment postings. This is a low security federal correctional institution with a minimum security satellite camp nearby. The website provides visiting information as well as job vacancies. A combination of several community groups in Connecticut, the CTJJA's mission is to reduce the number of young adults entering the juvenile justice system by providing education programs and criminal justice support for at-risk youth. The website includes legal fees, information about hours and court closings, a listing of Superior Court Judges and volunteer and job opportunities for qualified candidates. A Hartford based group focused on court reform and juvenile justice issues in Connecticut. Their efforts include partnerships with government programs, university systems and communities promoting overall public safety. The Judicial Branch recruits for a number of positions, including Judicial Marshal trainees, assistant clerks, office clerks and juvenile detention officer trainees. The website includes updates about job openings, the job shadow program and experiential learning programs. With offices in New Haven, Hartford and Bridgeport, the United States District Court website for Connecticut includes information about jury services, legal forms and programs and services. A public policy and advocacy group providing legal, educational and research information regarding women's equality issues in Connecticut. From legal help to legislative advocacy, the group offers for volunteer and internship positions for students. Legal resources for lawyers and aspiring lawyers that need information about legal representation in Connecticut, access to legal publications and CLE/Education information. Organization that offers free legal advice for low-income residents of Connecticut. Includes details about offering pro bono services and volunteering with the organization. The University of Connecticut School of Law Thomas J. Meskill Law Library maintains a comprehensive database of legal research guides, an online catalog of legal treatises and a database search tool for easy retrieval of information. Those searching for police officer and sheriff patrol officer jobs can find new listings and updates about training programs on this website. Includes comprehensive job descriptions, educational requirements and licensing information. The official police union page for Connecticut officers gives inside information on what it means to be a peace officer in the state. From benefit information to team building and special events, prospective police officers can also find out more on the history of the group on this page. This website is dedicated to protect and promote the welfare of police officers throughout the state of Connecticut. It includes a membership application, insurance information and resources for police officers at all career levels. The DEEP Wildlife Division provides information about wildlife and habitat management throughout the state of Connecticut, permits, programs, services and the latest reports on different animals and birds. This organization promotes environmental quality through educational programs and conservation efforts. Its plan has been approved by the U.S. Fish and Wildlife Service. The website includes a wealth of resources, tools and educational information.This organization promotes environmental quality through educational programs and conservation efforts. Its plan has been approved by the U.S. Fish and Wildlife Service. The website includes a wealth of resources, tools and educational information. The CLCC works to increase the pace, quality, scale and permanency of land conservation in Connecticut. Includes information about bylaws and business plans, its annual conference, and training and educational opportunities.